Nipping out for a drive just for the pleasure of it is something we don’t always get the chance to do. 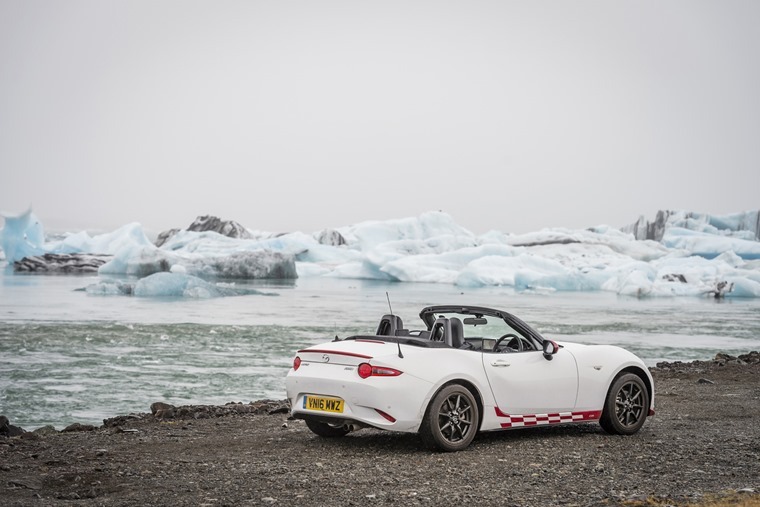 However, when the opportunity comes knocking to pop out in a Mazda MX-5 around Iceland, you’d probably clear your diary. We certainly did. 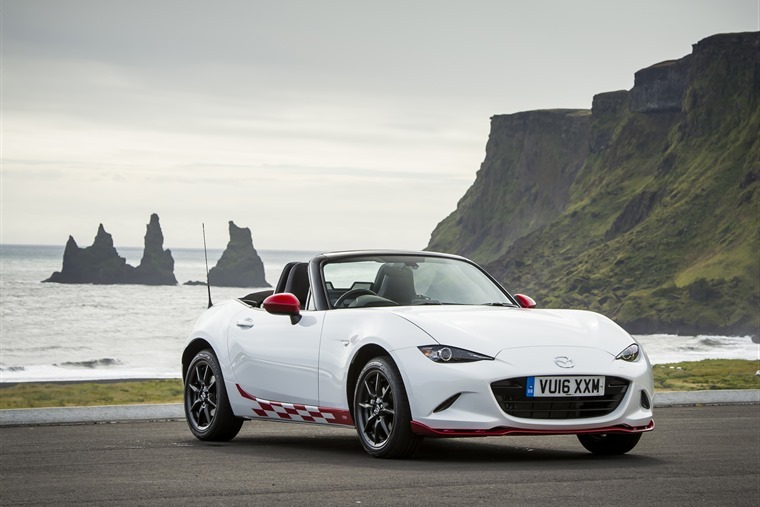 This particular driving occasion came about as Mazda launched the UK-only MX-5 Icon special edition. Only 600 will be produced, complete with either white or grey metallic paint, 16-inch alloy wheels and red highlights on the front splitter, sills and door mirrors. It’s based on the 1.5-litre model, so has 131hp. 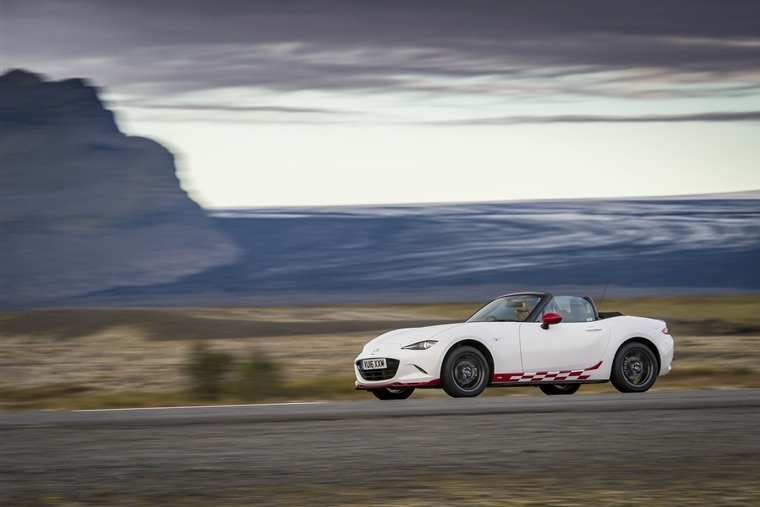 With the less powerful engine option fitted, this MX-5 might not sound like the perfect partner for an 850-mile trip all the way around Iceland. After all, this is big country with vast empty spaces and not a lot in between. Any such concerns were soon swept aside by the grandiose scale of the place. If you haven’t been to Iceland, think of it as the Scottish Highlands but about five times bigger and with less than a tenth of Scotland’s population. So, yes, there’s plenty of space to enjoy yourself, even in a wee sports car. 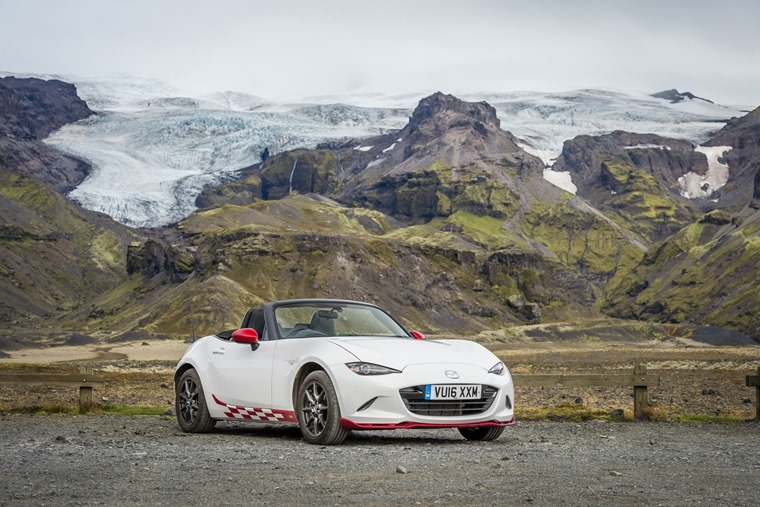 It also helps that MX-5’s are not just rare in Iceland but almost unheard of. 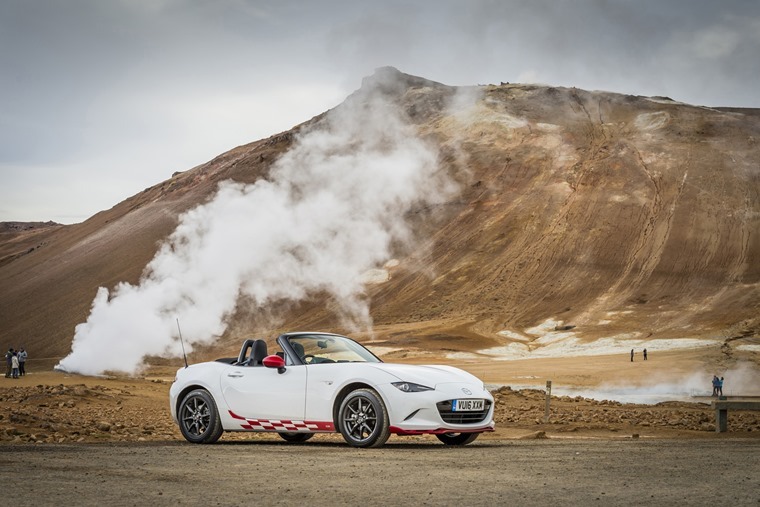 The six cars that were sent over for this event quadrupled their population on Iceland as the local Mazda dealer has only ever sold two in all the time the roadster has been available. Little wonder the car attracted so much attention wherever it went, and not just because the roof stayed folded down as a matter of principle. This was easy on day one as we headed north and then east out of Reykjavik. The capital city is a nice place and its rush hour was positively calm compared to what most Brits will be used to. 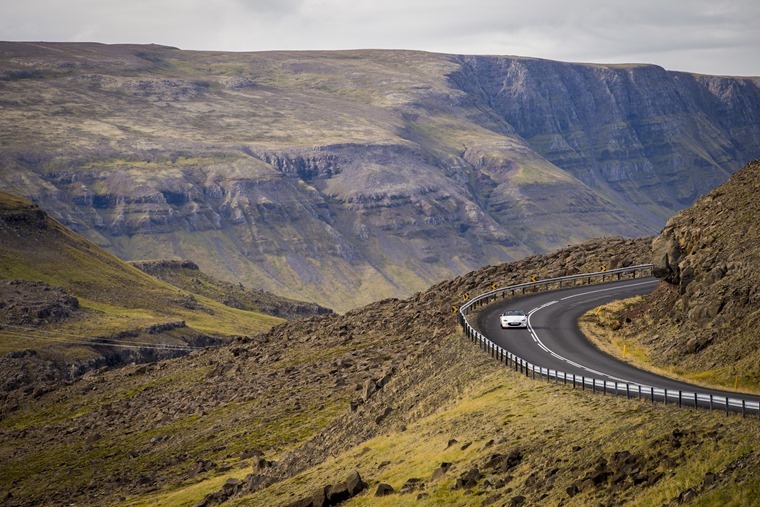 Once clear of the urban sphere, it didn’t take long for the Icelandic coast to start working its charms on the road layout and our impression of the place. Not only is it vast in size, it keeps on changing. Just when you think you’ve got a fix on the type of landscape you’re travelling through, it goes and swaps for something new. In a matter of hours, we went from rolling coastal scenery to mountains, then on to high moorland, heavily wooded hills and then farmland. Rocky crags then sprout up before giving way to sporadic villages. All of this is spread along the road that circles the island, which is simply numbered ‘1’. Given it has no rivals, it probably doesn’t even need that name, but it certainly makes navigating easy. Another Icelandic trait is the paucity of other vehicles on the road. Apart from a few tourist coaches, we rarely saw any other cars once away from the populated areas. At one point, we counted 27 minutes before spotting another vehicle of any sort. No wonder the Icelanders are a self-sufficient lot. You might think, given this remoteness, we’d be travelling with ice shovels, spare wheels and survival kit. Not a bit of it. 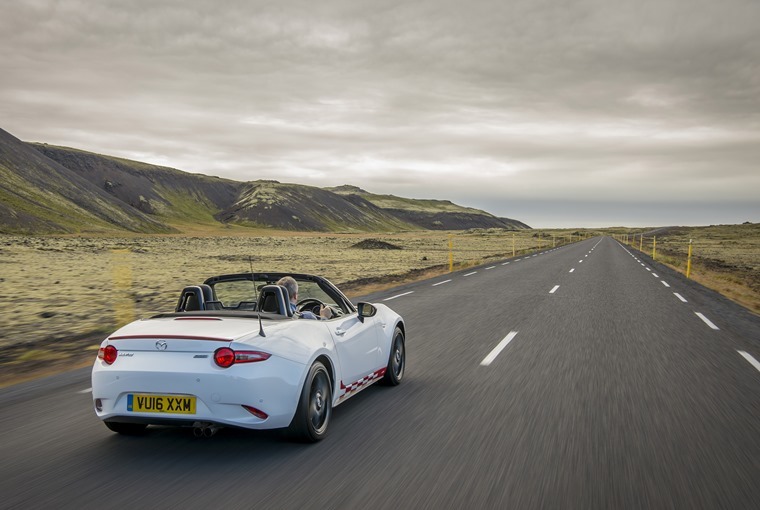 All we had was a packed lunch and flask of coffee from the previous night’s hotel and the MX-5’s sat-nav – the navigation simply there to let us know how long we could expect to be on the road ‘til that evening’s stop-over. As we left Reykjavik, it reckoned 13 hours to cover 450 miles. That was calculated on Iceland’s strictly enforced 90kph maximum speed limit. In the city and its environs, this was obviously and prolifically true as we spotted several cars pulled over by the police. Once away from town, the roads open out so you can see far ahead and maintaining a constant speed is easy. As a result, we arrived in around nine hours but did little in the way of stopping. One halt was at a natural thermal spring, where water spouts out of the earth at around 85-degrees centigrade. It’s more than hot enough to scald, though the stink of sulphur would have you heading in the opposite direction long before the heat was an issue. Our night’s stopover came at Egilstaddir. It’s a functional kind of place, but no worse for that. The hotel was comfortable and dished up good food, but another early start demanded a quiet evening and early to bed. Fuelled by coffee and an Icelandic breakfast, which curiously included the option of chocolate digestive biscuits, we were back on the ‘1’. However, we chose a small deviation up and along the unmade 939 – this is more like a rally stage than a road, but definitely saved us some time that we’d need later on. The second morning was similar to the first only in the way that the scenery kept shifting and changing. By mid-morning, there was a constant on our right-hand side though, as the glacier that runs along this south-eastern stretch loomed. Arriving at Jökulsárlón, which is a huge lake, we pulled in and the reason for our earlier time-saving detour paid off. We had plenty of time to watch the giant chunks of ice slowly drift by as they headed towards the sea. A little further on, we found another place to stop where we could walk up on to the glacier itself. Without a guide, hard hats, and climbing equipment, we could only go a little way, but it was enough to start understanding the sheer size of this ancient, constantly moving ice. It lends this part of Iceland a very different feel to the other areas we’d driven through and there’s something very ‘Lord of the Rings’ about the scale and power of the natural world here. 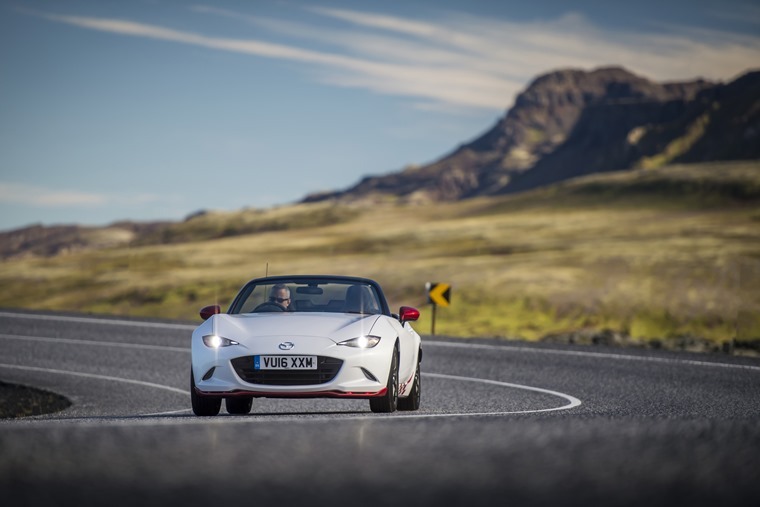 Back in the rather more compact but no less comfy cabin of the MX-5, it was time for the final run back to Reykjavik. So far, we’d enjoyed the heated seats, warm blast from the heater and the free-revving engine. The suspension’s superb control had also taken everything Iceland could throw at it with controlled ease. Then it started to rain. Not a sprinkling or a shower, but heavy, dowsing Icelandic rain. One farmer who had pulled over to chat about the MX-5 earlier said he reckoned winter snow was only a few weeks away and judging by the shiver of this downpour, it was coming sooner rather than later. Undeterred, we kept the roof down and made it into the capital by late afternoon. The MX-5 was filthy on the outside but toasty inside. 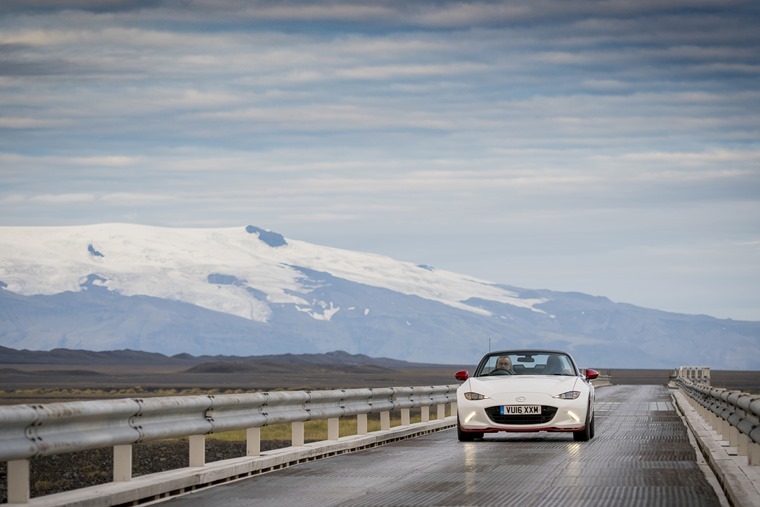 We’d had a ball driving the Ring of Iceland and cannot imagine a better car for the job. So much so, it’s got us wondering where can we nip out for a drive to next?